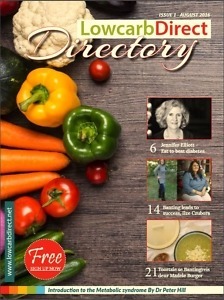 Home Book Reviews LOW CARB DIRECT, A NEW, INTERNATIONAL MAGAZINE! I am pleased to announce the birth of a great new resource to help you succeed with your healthful, low-carb lifestyle. Low Carb Direct is the brainchild of Esther Moller, who is part of the low-carb community in South Africa. They call themselves Banters after an English carpenter and undertaker named William Banting, who published a book at his own expense in 1869 because he wanted to spare others from suffering from obesity as he had. Banting’s book, Letter on Corpulence, describes a diet that is very similar to those later promoted by Dr. Robert Atkins, Drs. Michael and Mary Dan Eades, and others. He wrote, “I can confidently state that quantity of diet may safely be left to the natural appetite; and that it is quality only which is essential to abate and cure corpulence,” in other words, it is what you eat and not how much that matters. Esther Moller is a modern-day William Banting. This magazine is her way of showing her gratitude to the low-carb community who gave her the gift of health and freedom from a life of morbid obesity. It is her way of paying it forward. Fitness expert, Prof. Tim Noakes, was instrumental in popularizing the Banting movement in South Africa. He was put on trial by the Health Professions Council of South Africa after he was accused of unprofessional conduct for giving low-carb dietary advice via a short tweet to a mother about what to feed her baby. When he recommended weaning her child onto real food rather than cereal, he was charged with malpractice, even though he is no longer practicing medicine and the woman in question was not his patient. His reaction? Bring it on! He was eager to educate the committee and hopefully get a lot of media attention. Like Galileo, who was persecuted for daring to suggest that the Earth revolves around the sun, he has science on his side. Galileo was pardoned by the Catholic church in 1992. I trust Prof. Noakes won’t have to wait 350 years for his vindication. People like Prof. Tim Noakes and Esther Mollar are making the world a better place. I’m so proud of Esther and the South African band of Banters! 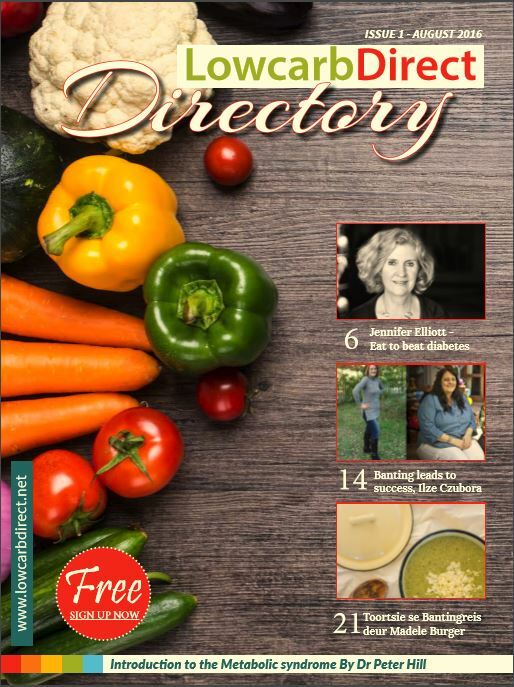 Low Carb Direct is an interactive magazine and you can be part of it too! Go to the website at www.lowcarbdirect.net and click “e-magazine” in the upper right to get your copy. Esther Moller, Prof. Tim Noakes, South Africa, William Banting. Bookmark. The link shows this is not a valid website. Is there a better link to the magazine? Dori, Esther is still working hard for the low carb cause, but the magazine is gone. It was wonderful while it lasted!